New information on Granzella's upcoming survival game. 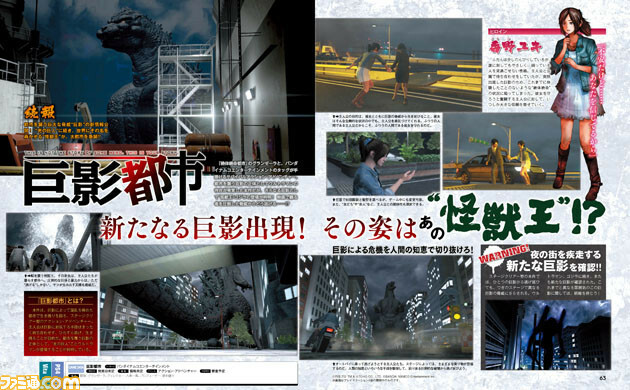 The latest issue of Weekly Famitsu reveals and teases new monster characters set to appear in Bandai Namco and Granzella’s upcoming City Shrouded in Shadow. In City Shrouded in Shadow, the protagonist’s goal is to, together with the heroine, escape the threat of giant shadows attacking the city. Players can choose their starting clothes and hairdo, and the player can even make friend and love interest decisions. In addition to the previously introduced Ultraman, the giant shadows will also take on the form of the King of the Monsters himself, Godzilla. Additionally, another screenshot in the magazine (lower right of the scan) teases what appears to be a silhouette of an Evangelion. City Shrouded in Shadow is in development for PlayStation 4 and PS Vita.